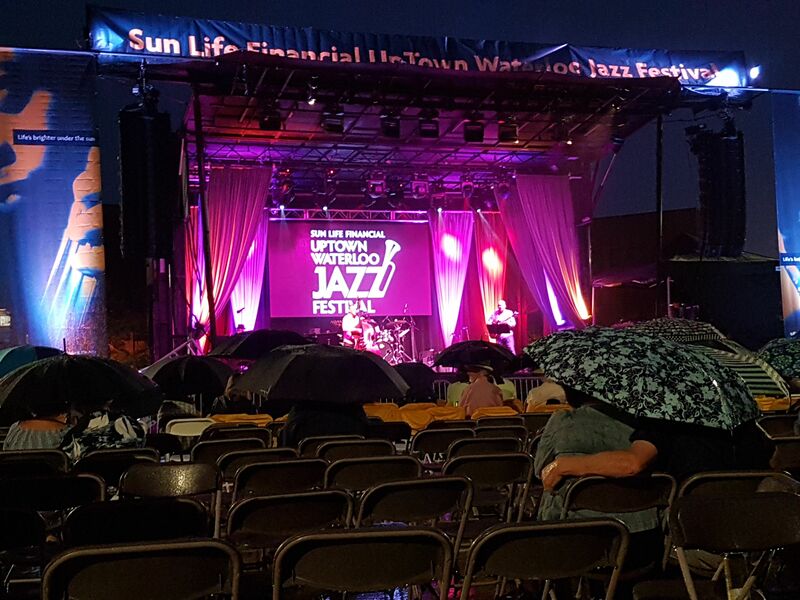 Despite a short visit by the rain, the rest of the second day of the Jazz Festival was amazing! 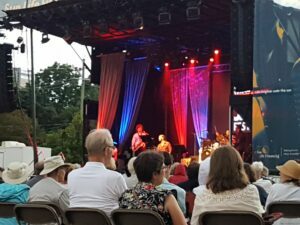 We started the evening watching Fern Lindzon, a wonderful vocalist and pianist with her quartet that included the amazing Colleen Allen who plays the most surprising range of wind and woodwind instruments from the piccolo to the tenor sax. I mention her in particular as she also plays with Manteca, the feature band of the evening. Following Fern was the Ted Warren Commission, a quartet led by percussionist Ted Warren that put on a great show of traditional jazz – he has a great sense of humour as well! And the finale of the evening, Manteca! who did not disappoint and had the crowd up and dancing while barely into the first song of the set. As mentioned above, Colleen Allen was there with her amazing array of instruments – great show! One thing of note is that there was an artist doing a live painting of the band on stage during the performance. You can see her off on the right edge of the stage in the video below. Interesting idea and the finished painting did quite a good job of capturing the energy of the performance. Unfortunately, as I write this, on Sunday morning, the rain is back in constant downfall which does not bode well for the final day of the festival. Fingers crossed that things clear up later this afternoon. 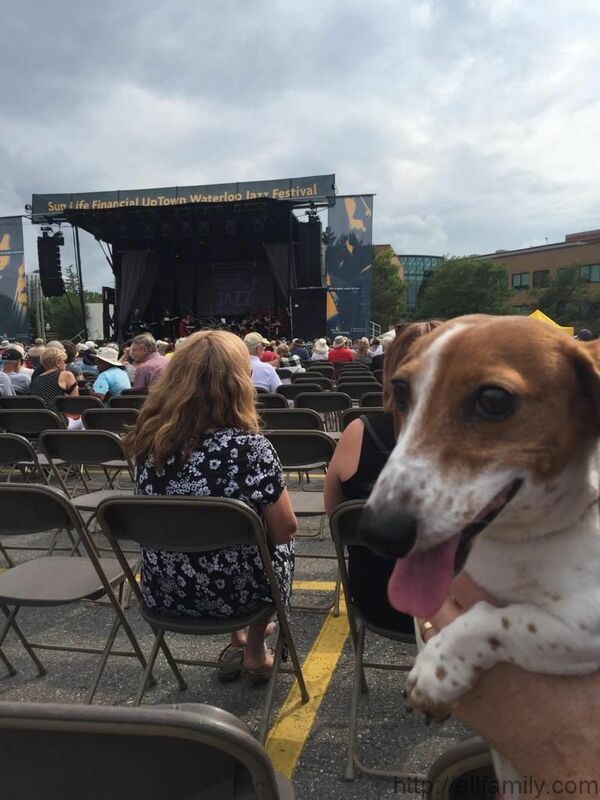 It’s the Uptown Waterloo Jazz Festival this weekend, one of my favorite weekends of the year. The main stage is literally a block from our house and underlines why we love living where we do. As the real estate agents say: the three most important things to look for in a house – Location, Location, Location. Though it doesn’t hurt that the location includes an 1886 build Victorian. Amelia, Anneliese, and I caught two of the performances today. The first was percussionist Marito Marques and band playing wonderful latin inspired jazz. Lots of people enjoying the music. 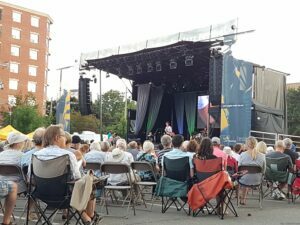 The sun was out but not too hot – it was a great show. Just as the set ended, a few drops of rain started to fall so the girls and I headed back to the house for a snack and to pick up umbrellas. 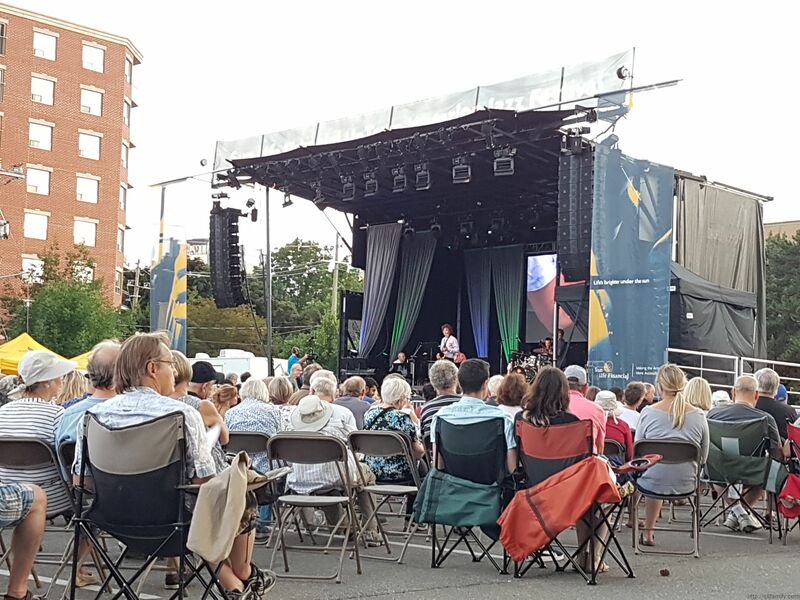 The second show was the headliner for the night – Bassist Mike Downes and friends doing a selection of originals and standards. Again, a spectacular show though somewhat dampened (no pun intended) by the torrential rain that started to come down and continued for most of the set. I took a bit of video to give you a sense of what it was like. Quite a number of folks headed for the exits but the rest of us popped open the umbrellas and settled in for what turned out to be a wonderful and intimate set given the size of the venue and the conditions. As I’m listening to rain come down hard and steady outside the window, I have my fingers crossed that tomorrow will be drier. Lots of great jazz still to come! I’ll leave you with another little sample of Mike Downes to end the night.